You must be one of the few people still running DescriptionExtender.tap; most are using the [De] patch (which comes courtesy of the MyStuff installer). I'm not sure that the [De] patch is compatible with EPG Navigator - there is a 7 page thread about it which you could work through to see if it was ever released for general use. If there is, I suggest you use the Build Offline MyStuff Installer (from my website) and install MyStuff (option 1) - this will give you all the patches you require plus add some extra taps to Auto Start and the \ProgramFiles\Utilities folder. Then, as you wish to run EPGNavigator, remove the taps that the installer added to Auto Start. You should not remove the PruneEPG tap; this prevents the EPG buffer overflowing. I also see that your signature doesn't include the T letter in the version; T believe "T" was added so that other members could easily see that the firmware had the relevant patches i.e. you are missing some desirable and possibly essential patches. You could post an up-to-date MyInfo Log. Note: your signature implies that MyInfo is version 5.5; you would need to update that first. The easiest way is to install TopManager on your windows pc and use the Tools| Install Files| MyInfo option. Then, run MyInfo (or reboot and wait 2 mins) and use the Display| MyInfo Log option. Use copy and paste operations to add the log to this thread. From memory, the last version of EPGNav that I used had a menu option to select the tap or the de patch. Wow, it's 10 years since I decided that hacking around in MIPS assembler was far too tedious and best left to people more skilled at it! You must be one of the few people still running DescriptionExtender.tap ..
As a data point, I still use Description Extender 2.1 and EPGNavigator 5.1c on TF5800 -- I just checked Film4 and I can see full details of the programme info. Well that shows it is possible. The only obvious difference from the above is that MikB is using an older version of Description Extender. 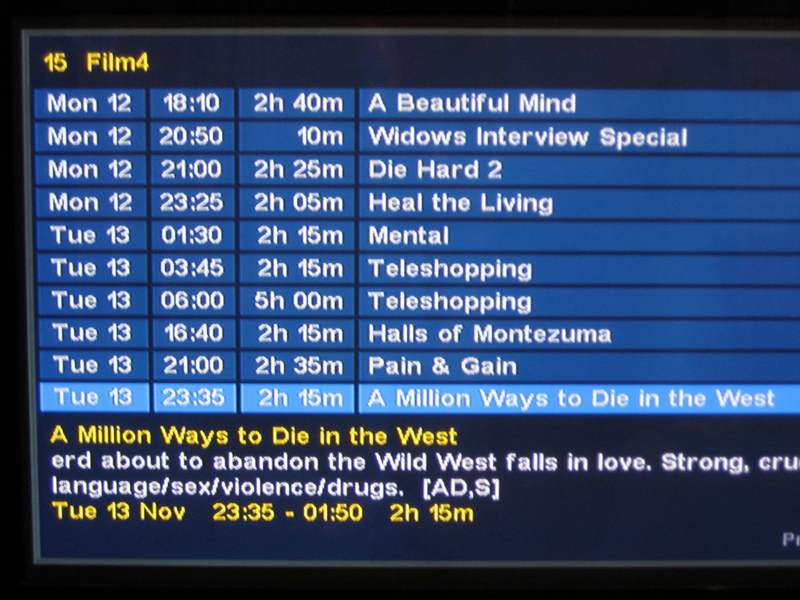 Slot 1: MeiSearch 1.30 : Provides EPG search functionality. That shows you have a duplicate channel name (on 200 and 250). Having said that, you are unlikely to record on this name so it probably won't casue any issues.